Arsenal responded to Arsene Wenger’s decision to quit the club this week with a 4-1 win over West Ham at the Emirates Stadium. 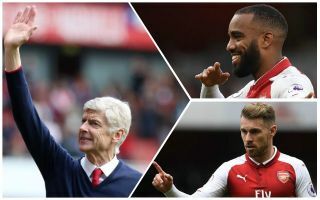 The Gunners left it late by scoring three times in the final ten minutes as goals from Nacho Monreal, Aaron Ramsey and two from Alexandre Lacazette got the job done. This morale-boosting result could be important after last week’s defeat to Newcastle, giving the club renewed hope of doing something in the Europa League this season as they prepare to face Atletico Madrid on Thursday. Plenty of good about that performance, with two players standing out in particular. On top of that, there can be no down-playing how vital those two Alexandre Lacazette goals could be for Arsenal’s Europa League campaign. The 26-year-old looks to be coming into form at just the right time, having now scored six goals in six games in April. Given that Pierre-Emerick Aubameyang is cup-tied in Europe, this gives Arsenal genuine hope of sending Wenger out on a high with a trophy – and perhaps more importantly – Champions League football for the next boss. It’s not games like this that will generally harm West Ham’s chances of staying up, but it’s pretty embarrassing for old Moyesey, let’s be honest.